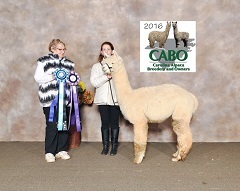 We have started the showing year at the CABO show in Concord, NC, where we took our 3 yearlings and 4 juvi alpacas along with our breeding male. All did very well with the ribbons. 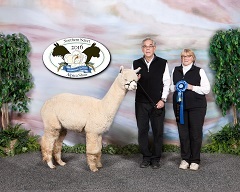 Our male 7SAF Ace's High is co-owned with 7 Springs Alpacas of Virginia. He took the white Championship as a 40 month old breeding male over all the young stock and then went on to be viewed in the Judge's choice class for males.. Thus we are offering a limited number of outside breedings this year--only 5- as we will be using him this year in our own herd. Take a look at this fantastic male to add genetics to your herd. Another blue ribbon at Southern Select for Ace, and now on to the nationals in Indiana. Now that the babies are all on the ground, we will head off the VAOBA show in December. come see us there with the show string of 4 females and 3 males.